Dr. David Chapman is getting set to host an event titled ‘The Wealth Building Cycle’ on July 25 from 6.30pm to 7.30pm at the Bermuda Industrial Union, along with a guided nature walk on July 28 through Abbot’s Cliff and Tom Moore’s Jungle. 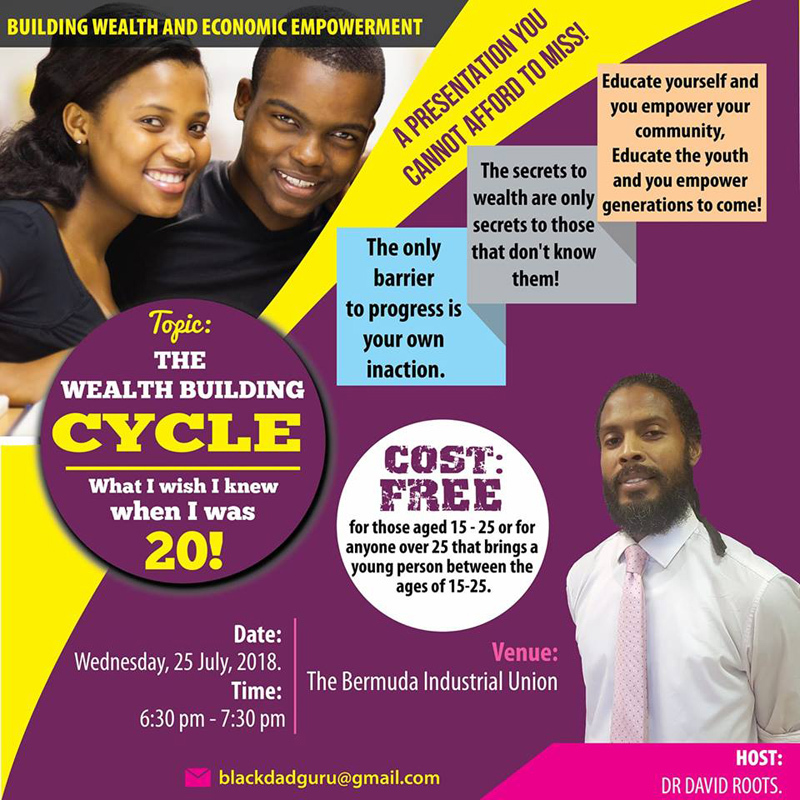 Dr. Chapman said, “The first event and the one I most excited about will be a presentation entitled “The Wealth Building Cycle – What I Wish I Knew When I was Twenty!’ This event will take place on Wednesday July 25, 2018 from 6:30pm to 7:30pm at the Bermuda Industrial Union. “I believe that changing the paradigm of generational poverty and economic dis-empowerment must start with the next generation. The secrets to wealth are not really secrets – they are just not shared by those who know them. “In this presentation, I will not be hosting a talk shop, but instead will be sharing specific, practical and real world strategies to building wealth that can be applied immediately. The reality is that while the number of young people attending university and earning degrees continues to rise, the gap between rich and poor continues to grow. “There is a specific and tangible reason for this and my aim is to expose this reason and offer a solution. The talk is free to those 15-25 years of age or to any over-25 that brings someone 15-25. Anyone older is welcome but we ask for a small voluntary donation to be made that will go towards the charity Youth Vision Promotions. It’s a presentation that cannot afford to be missed. “The second event will be a guided nature walk through Abbot’s Cliff and Tom Moore’s Jungle. The nature walk will involve high levels of activity including coasteering, cave exploration, hiking and wild foraging so will be exciting but very active so anyone that comes needs to be ready for an excursion. “It will take place on Saturday, July 28 with the meet time at 7:30am at Francis Patton school. We will use that as the starting point to explore nature trails through Abbot’s Cliff leading to and through Tom Moore’s Jungle. Getting wet may be needed so be forewarned. We aim to finish around 1 – 2:00 pm but due to the nature of the event this end time will need to be fluid.